Surround yourself with the books you love as you lounge on the ‘Bookworm’, a combination chair/bookcase with a sculptural curving design by Atelier 010. The Bookworm chair even has built-in lighting, making it a compact all-in-one reading area. Thin layers of MDF and plywood are curved across custom-made molds to create the swooping shape. 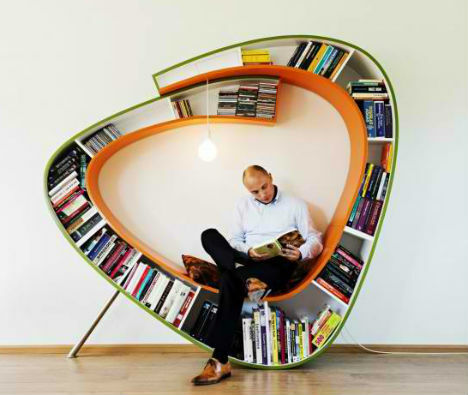 The bookcase chair is self-supporting, kept upright by a stainless steel foot extending from one wall. The outside walls are spray-painted in bright colors, while the insides are white. 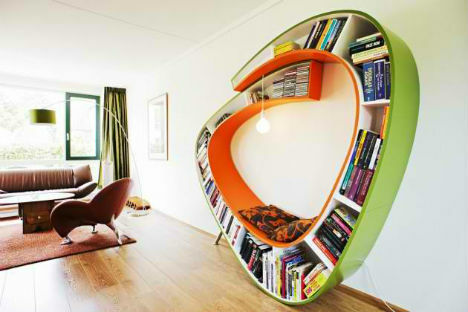 This comforting, cave-like combination of seating and book storage is not entirely unique. 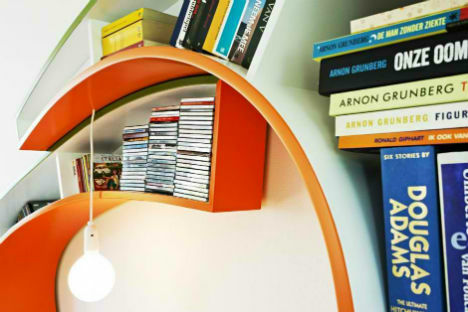 Similar designs have included ergonomic padded lounge areas built into conventional-looking bookshelves, and benches with bookshelf supports.